Maui Electric crews are continuing restoration efforts in parts of Upcountry including Haʻikū, Olinda and Piʿiholo this morning to bring approximately 455 customers back online. Customers in ʻĪao Valley are also experiencing a power outage after a large tree came down on power lines. Outage notifications are posted on the company’s Twitter account @MauiElectric with the #MauiOutage. 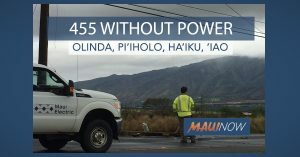 The public can also sign up for outage and restoration updates at www.mauielectric.com . 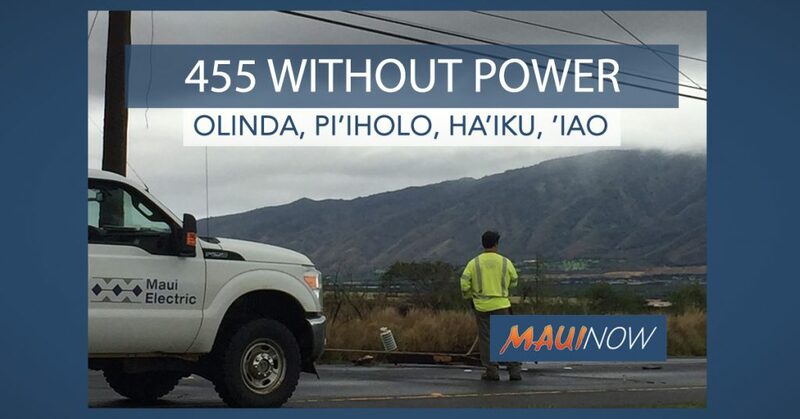 After working into the night, Maui Electric crews are continuing restoration efforts in parts of Haʻikū, Olinda and Piʻiholo this morning to bring back a remaining 455 customers. Customers in ʻĪao Valley are also experiencing a power outage this morning after a large tree came down on power lines . Additional damage assessments and repairs are being made to electrical equipment brought down by storm impacts yesterday.